Ever since I was little I've had a very good imagination. Whenever I got a "good movie" going on in my head, so to speak, I would pace back and forth and begin quickly moving my hand and fingers in tune with any action I was imagining. Often I'd become completely engrossed in the mental movie I was creating. It was completely voluntary, it allowed me to be, on some level, physically part of the imagining. I do artwork now-a-days, and once in a while, I'll be brainstorming some good ideas and I'll find myself doing it, like I did when I was a child. Its odd behavior and I can't seem to find any information anywhere online. What exactly would this be under? It seems to me that your imagination has been in the past for you a way of escaping the situation you are in, thinking back do you see a pattern that would suggest that this is true? If it is true then perhaps you still use it today to not deal with your emotions. I know that when I was a child I would go off in a fantasy life of my own and when I really thought about it I noticed that the trauma I went through was related to my fantasy life and that occasionally I still used it when I am dealing with a lot of emotions (such as the loss of someone)I would find myself saying I can't deal with this and I would start thinking on things that I was in control of such as my fantasy life. I hope this helps. 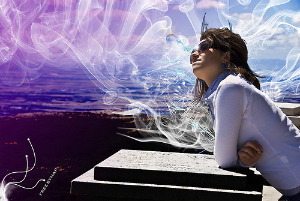 Read the March 2011 article in Scientific America Mind about the power of day dreaming. Should answer your question.